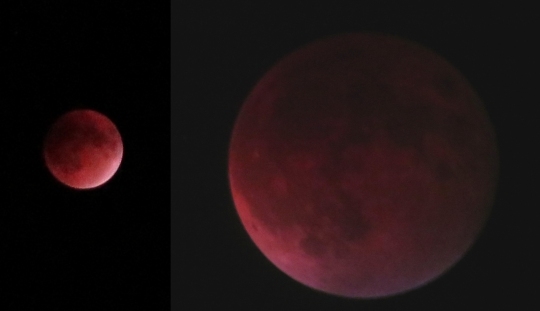 If you watched the lunar eclipse on September 27th, you were treated to quite a sight! My wife got some great pictures of it, two of which are shown above. The image on the left is a picture she got with her camera alone, and the one on the right is what she got with her camera looking through my telescope. That was a particularly difficult shot, because the camera wasn’t designed for the telescope. She just pointed her camera at the eyepiece and patiently played with its orientation until she got the best shot she could. The eclipse was beautiful, but it did produce something unexpected: a dark moon. Now, this eclipse was supposed to be dark, because the moon was at its perigee, which is the closest it gets to the earth. As a result, the earth’s shadow covered it a bit more thoroughly than it would have if the moon had been farther from the earth. Nevertheless, a lunar eclipse doesn’t make the moon go completely dark, because sunlight is bent through the earth’s atmosphere and shines on the moon. The process of sunlight traveling through the atmosphere produces a noticeable effect. Sunlight is composed of many different wavelengths of light, each of which corresponds to a color that we perceive. The longest wavelengths of sunlight are red, while the shortest wavelengths are blueish. The other colors (orange, yellow, and green) are in between. Because wavelength and energy are inversely proportional, red sunlight is lowest in energy, and blue sunlight is highest in energy. Once again, the other colors are in between. Well, when sunlight passes through the atmosphere, it can bounce off particles and molecules floating in the air. Higher-energy light tends to bounce off more things than lower-energy light, so as sunlight passes through the earth’s atmosphere, the blues and greens tend to bounce around more than the reds, oranges, and yellows. This is why the sun appears reddish-orange at sunset. When you look at the sun, the light you see is traveling straight from the sun to your eyes. The closer the sun is to the horizon, however, the more atmosphere its light must travel through to reach your eyes. Since the blues and greens tend to bounce off things in the air, they don’t travel as straight as the reds and oranges. As a result, more red and orange light coming from the sun hits your eyes than blue and green light, so the sun appears reddish-orange when it is near the horizon. The same effect causes the moon to appear reddish-orange during a lunar eclipse. Of course, all of this is well-understood, so long before the lunar eclipse happened, some astronomers had calculated how bright the moon should have been during the lunar eclipse. When astronomers actually observed the moon, however, it was measurably darker. The graph below comes from Universe Today. 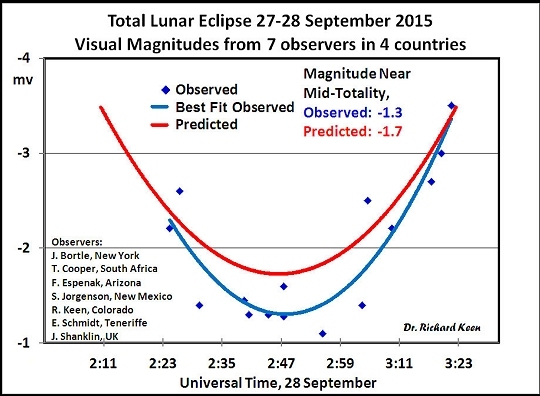 It shows the expected brightness (magnitude) of the moon (red curve) compared to the observed brightness (blue curve). Because of the way magnitude is defined, the more negative the number, the brighter the moon. Thus, the observed magnitude (-1.3) is darker than the predicted magnitude (-1.7). Why was the moon darker than expected? We don’t know for sure, but Universe Today suggests that it is the result of small solid and liquid particles, collectively known as aerosols, floating in the atmosphere. The eruption of Chile’s Calbuco volcano five months ago spewed lots of dust and ash in the air. Most likely, some of those aerosols have yet to settle back to the ground. In addition, the forest fires in Canada and the Western U.S. this summer put lots of smoke particles in the air, and some of those aerosols probably haven’t settled out of the atmosphere, either. Finally, human-produced pollution is probably to blame as well. When we burn coal and oil for energy, it produces aerosols that linger in the atmosphere. Imagine that. The lunar eclipse was both beautiful and informative! Congratulations to your wife for capturing the images. She did a good job with the telescope to capture that image since I’m sure it is hard to get a good picture without adapters and dedicated cameras. I recently attended an on line cytology course as part of my required continuing education. I was surprised to find that the instructor captured many of her images for the course by using her cell phone and simply holding it up to the eyepiece lens of the scope. During the course I checked on Amazon and found many adapters for cell phones to be used for photomicrography. After reading your blog I decided to look and see if cell phone adapters were available for telescopes. I found a number of cell phone adapters for telescopes and will try to provide a link to one of them below. The link has some sample images that look pretty good. If the link doesn’t work, simply Google cell phone adapters for telescopes. Wow! I didn’t know such a thing existed! I just put it on my wishlist. Perhaps I will be able to use it after Christmas. I forgot to mention there are a couple moon images if you click on the 5 customer reviews. Dear Dr Wile, my respects to you and all your efforts. I began using your texts in Colombia, SouthAmerica through Bridgeway Academy. Years later, my kids did their own studying and experimenting while I concentrated on trying to get them certified meeting national requirements and passing national – secular tests. It was a challenge to get the criticism of those whose kids saw a little of every subject all throughout their yearly curriculums, rather than our specific theme per year like us, but I cared more about my kids learning than comparing themselves to others. Nevertheless, when national tests questioned them on evolution vs creationism or Biology while we had just completed general science….things got tough. 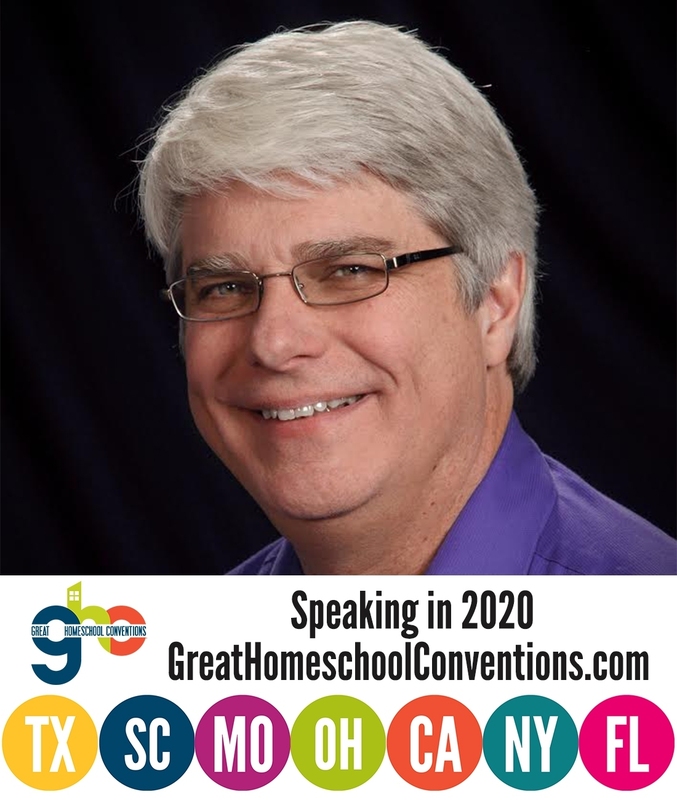 In any case, your books remain such a treasure to our family that today, in my facing the opportunity of guiding an entire Christian school from their switch of secular curriculums to all-christian homeschool curriculums, I only want your texts. 1. Do your new editions of chemistry have any changes (additions) to the organic/inorganic subjects? 2. How deeply did you differentiate evolution and creation? In other words, can kids be considered “prepared” enough to correctly respond to secular science testing while understanding God´s real design? 3. If I only have 11 grades in which all kids are obligated to complete physics, (rather than 12 years), what text sequence would you suggest for us? 4. If I just have to make a snappy combination of texts in order for elementary 5 graders to prove they know a bit of all their basics for national testing, how would you suggest I approach my selection? 5. My kids were musicians and we didn´t have enough time to see everything. So I wonder, do you consider that a full “Dr. Wile student” can be scientifically creative enough to participate in challenging science fairs? Which text focuses on the ability of “creating”? 6. Finally, with the interest of a group of english-speaking friends and scientists I used to live next to (when I used your books), I made numerous attempts to suggest Apologia to translate your texts from here. I never got a response. But I know I speak for many, and would like to know your opinion on printing your books in spanish…? May God continue to bless you greatly on your new endeavors!!! (I´d like to be on your list of prospect clients for new releases). I am not associated with the third edition of Exploring Creation with Chemistry, and I do not recommend that anyone use it. I do have a new chemistry course out, and you can learn about it here. There is no substantial change to the topics covered, however, since the selected topics prepare students so well for university-level chemistry here in the U.S.
Students who take my biology course often test out of first-year university biology, and those who take university-level biology are very successful at it. Thus, I do cover what students need to know about evolution. I also explain what is wrong with the hypothesis. I would suggest that you do biology in the 9th grade, chemistry in the 10th grade, and physics in the 11th grade. I would personally suggest my new elementary series. Since it covers science as we learned it in history, it is a good overview of science. However, I have no idea whether those topics would meet your country’s standards. You could also choose a selection of books from this series, choosing those topics that are covered in your country’s standards. There is no single book that focuses on creating. I teach the individual subjects, and I promote creative thinking in each. If you are discussing books published by Apologia, I have no control over them. Only Apologia can grant permission for those books to be translated. My elementary series and new chemistry course, however, are published by another company, and we can work with you (or someone else) on translations. The problem, however, is that it is difficult to translate some science concepts, so it takes more than a literary translator. That translation must be checked by a native speaker who is a scientist. Debunking the Flat Earth Myth Do Selfies Result in More Deaths than Shark Attacks?